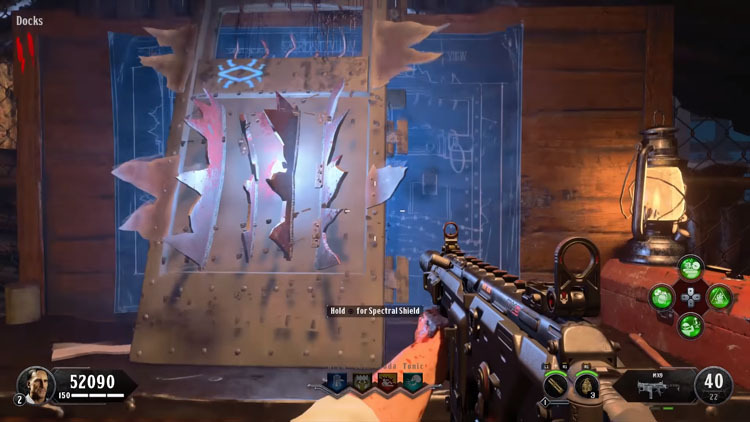 The trustworthy shield is back in Blood of the Dead zombies and in this guide you'll find exact locations for each of the Spectral Shield parts and instructions on how to complete the build. Not only is the shield an important survival tool it's also essential for the Easter Egg and Pack-a-Punch. Returning players will remember the buildable shield from it's introduction back in Black Ops 2. This defensive item was a complement to the existing Jug perk (which we now know is removed in Black Ops 4) providing players with complete protection from melee attacks from behind. Later in Black Ops 3 (Gorod Krovi), the shield was enhanced to allow players to shoot a fiery blast. The shield can be used to protect attacks from the front or behind. When drawn, the shield is forward facing, allowing the player to block and melee through groups of oncoming zombies. When withdrawn (i.e. placed on the players back), the shield provides automatic protection from behind. This will increase the number of hits before your actual health is affected by attacks from behind (i.e. before the shield breaks). 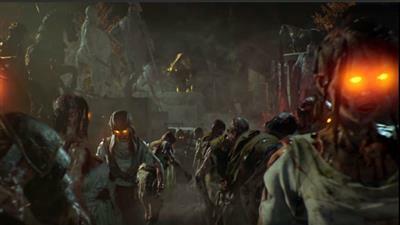 A new feature in Black Ops 4 zombies. When drawn, players can hold the bumper buttons on the controller to use the special side arm (weapon) to collect zombie souls. This lightweight weapon fires a small electric charge which damages zombies and collects their souls at the same time - essentially charging the shield. Once the shield is sufficiently charged, players have the option to use Spirit Blast when the shield is drawn. Again, using the bumper buttons on the controller, players can aim and shoot a small blast of spiritual/electric energy. These blasts play an important part in the map, replacing the traditional purgatory feature where players would charge the fuse meters around the map. 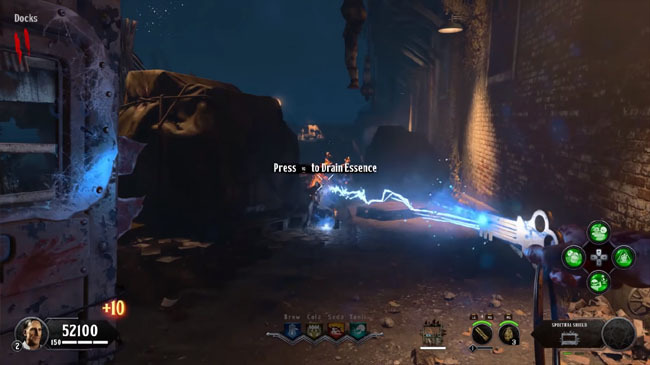 Instead of entering purgatory (which is now gone in Blood of the Dead), players shoot Spirit Blasts to charge these same meters to open inaccessible gates etc. The Shield requires three parts to build. Locations are random but generally within the same confined areas. I only have a limited number of locations so far but will be adding more as they're discovered. Always in the vicinity of the Citadel Tunnel. Always found on a red fuse box. The final part of the shield is the key which allows you to collect zombie souls via the "Drain Essence" feature. This part is very easy to find - simply kill Brutus when you first encounter him, usually after turning on Power at Building 64. Once you have all the shield parts, completing the shield requires a workbench (shown in image above). There are a set number of workbenches, at fixed locations on the map. One good example is in the Docks, just outside the door of Building 64. Simply walk up to the workbench, interact by holding down the appropriate button and the shield is slowly built. Once built, interact again to pick it up. Remember, when you shield breaks you must return to the same workbench where the shield was original built to reclaim a brand new version.